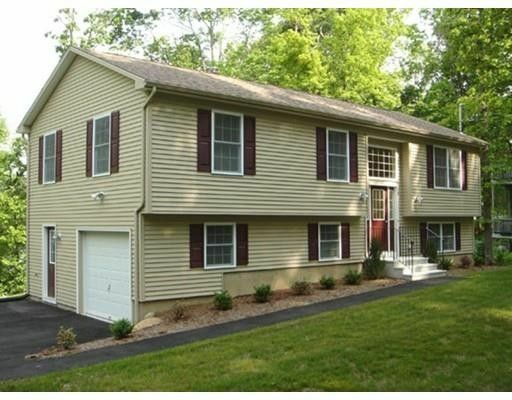 BRAND NEW CONSTRUCTION IN BRIMFIELD!! Desirable open floor plan w/vaulted ceilings, recessed lighting and stunning bamboo floors throughout. Sun-filled kitchen includes stainless appliances, CENTER ISLAND, recessed lighting, pendant lights & spacious eat-in dining area. Sliders lead to a 10x10 entertaining deck overlooking the beautiful, wooded lot w/garden area. Lovely yard, great for grilling, bird watching & room for all your animals and toys. Master bedroom includes 3/4 master bath w/tiled floor & granite counter vanity. Lower level is insulated w/large, daylight windows & ready for your finishing touches if more space is desired. One car garage w/garage door opener & side entry door leads to a tiled hall w/large storage closet, perfect entry for coats, snowy boots & book bags. Bring your fishing poles, close to Lake Sherman boat ramp, the famous Brimfield Antique Show, the Brimfield State Forest and the bike trail! Only 10 min to the MA Pike in Palmer or Sturbridge! Directions: Rt 20 to Brookfield Rd to Cubles Dr, 1st right on Forest Rd, 3rd left is Crestwood Rd, see sign.